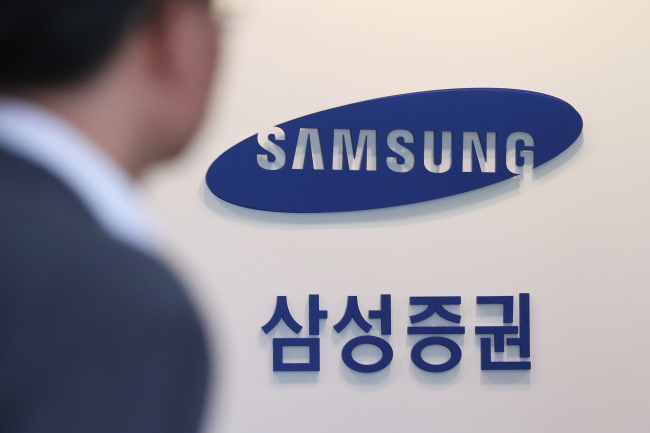 Samsung Securities on Thursday was fined 144 million won ($128,500) and imposed a six-month suspension for parts of its business by the financial authorities over a failure to prevent a dividend fiasco that broke out in April this year. The brokerage arm of Samsung conglomerate will be banned from brokering equity securities transactions of new investors from Friday to Jan. 26, 2019, according to the Financial Services Commission. Incumbent Chief Executive Koo Sung-hoon was slapped with a three-month business suspension, while two former CEOs Yoon Yong-am and Kim Suk were imposed disciplinary actions that equal a layoff. Kim Nam-soo, another former CEO of the brokerage firm and incumbent Samsung Life Insurance vice president, was given a one-month suspension. This came as the FSC, Korea’s top financial regulator, affirmed such disciplinary actions in a regular meeting Thursday, following its investigation from April 11 to May 3. Samsung Securities has been under scrutiny for failing to prevent the company from issuing unauthorized stocks to its employees as a dividend on April 6. The slipshod action led to price fluctuation of Samsung Securities shares, causing an 11.7 percent intraday drop.